Allie Stefanek drives around a Franklin defender during Saturday night’s Division II district championship game in Mason. 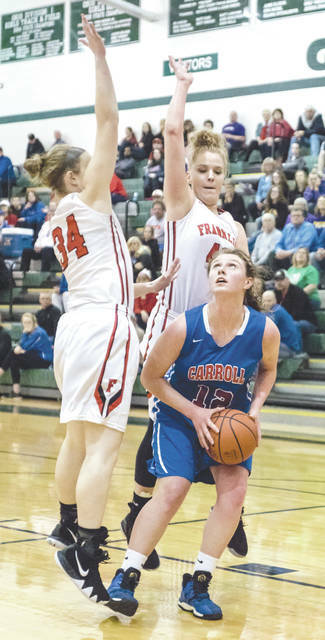 Carroll’s Elisabeth Bush (21) scored six points, along with Allie Stefanek and Julia Keller, in the overtime periods against Franklin, on Saturday night, March 3 at Mason Arena. Julia Keller (12) looks to shoot over a pair of Franklin Wildcats defenders during Saturday’s March 3 Division II girls high school basketball district championship game in Mason. 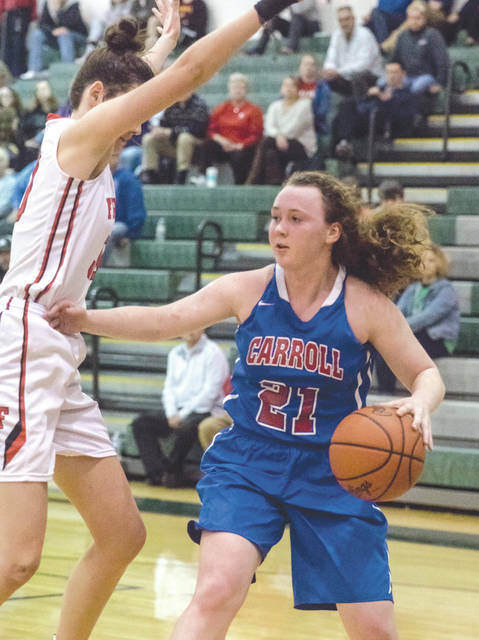 MASON — In a Division II girls high school basketball district title game that won’t soon be forgotten, Carroll’s season fell apart in 64 seconds. That’s the time Franklin needed in order to rally from a five-point deficit in the third overtime of Saturday’s March 3 thriller in Mason Arena. Carroll’s regular season scoring leader, Julia Keller, sank both free throws to give the Patriots a 51-46 lead with 1:32 left to play. But that’s when the Patriots’ shots stopped falling. First, Franklin’s Layne Ferrell hit a shot from the right baseline to pull the Wildcats to within three points, 48-51 with 64 seconds left. Carroll’s Allie Stafanek missed the front end of a 1-and-1 trip to the free-throw line, Keller nabbed the rebound, but the ball was deflected out of bounds off a Carroll teammate with 48.9 seconds left on the game clock. Again, Franklin (19-6) came down and scored. 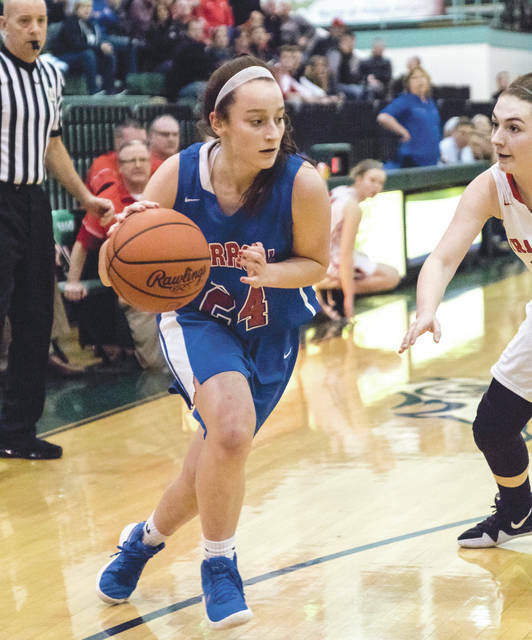 This time, it was sophomore Brooke Stover hitting a pair of free throws with 22.9 seconds left to play and the Patriots out in front by the slimmest of margins, 51-50. Carroll’s Julian Huber missed an inside layup as she was fouled by Franklin sophomore Kaylee Harris with 13.8 ticks left on the clock. Huber missed the first free throw and Harris grabbed the rebound. Then the shot that tore at the hearts of every Patriots player and fan happened. With 4.3 seconds left in the third overtime, Franklin freshman guard Jordan Rogers launched what seemed like a desperation 3-pointer from the right corner. Carroll (16-10) had one last try at a come-from-behind score, but a 3-pointer from the left corner by Marina Stevens bounced off the rim as time expired. Franklin had pulled off the improbable. 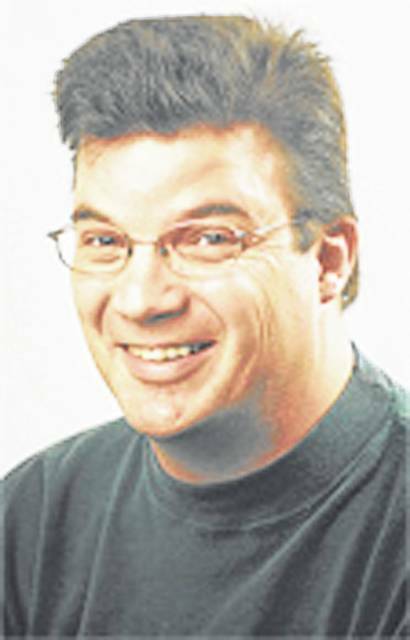 The ‘Cats rallied from a five-point deficit in those 64 seconds, and sent the Carroll players and their fans home in stunned silence. It’s why they play the games. It’s what’s amazing about the sport of basketball. But it’s also what hurts the most, especially when you’re on the losing end of a comeback like that. Stevens and Huber are the only two seniors who played their last games for a Patriots team that will return its three leading scorers — Keller (12.4 points per game), Elisabeth Bush (11.4) and Stefanek (11.3) — next season. “Those seniors are the ones who got this team to gel together as a unit, so we’re sad to see those seniors leave,” Grosselin said. Carroll’s season came to end, it’s true. But the Greater Catholic League North Division champion Patriots should be proud of how hard they played, in what turned out to be a very memorable district championship game for all involved. Franklin faces another solid team from the Greene County area in the Regional semifinals: Bellbrook (18-8), a team that has beaten Franklin twice during the Southwestern Buckeye League regular season, looms next. That game is scheduled for Tuesday, March 6 at Springfield High School.